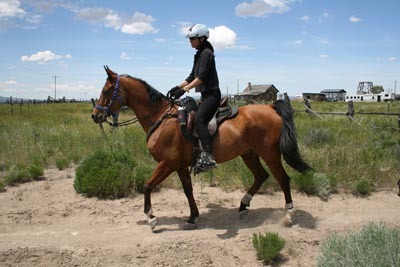 You might expect to meet a lot of varied, interesting people in the City of Dreams (Los Angeles); but an international endurance rider competing for a slot on the US Team in the World Endurance Championship in the 2010 FEI Alltech World Equestrian Games probably isn't one that readily pops into your head. But if you know where to look, you just might run into Charisse Glenn, of Malibu Endurance. A free spirited, well traveled, enthusiastic horse person who's lived around the world, Charisse says, "I never, ever, ever thought I'd end up living in LA!" but she's the first to admit that she's got the ideal location. 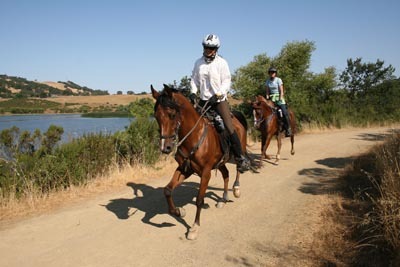 30 miles away from her doorstep is where she works in the LA show biz scene as a commercial casting director; 50 yards away from her doorstep is where she rides endless miles of trails in the Agoura Hills - a mix of National and State park and conservancy lands - to condition her two WEC qualified horses, Bogart VF and Steel Patriot. And they are good ones. Charisse has had the WEG in her sights and plans for over two years, and she has brought her horses along sparingly and carefully, averaging roughly 4 starts a season for them both. Steel, a 14-year-old, 3/4 Arabian, 1/4 American Saddlebred, is very dominant in his home herd, but a gentleman on the trail. "He's really honest. He gives you his all; he's really smart. He picks the best way for himself on the trail and he takes care of himself." That's probably what got him through 2 Tevis cup finishes (in two starts) in the top twenty, and his 21 completions in 24 starts. "He has an extra long stride, is very comfortable, and covers an amazing amount of ground effortlessly. He has a 7 mph walk, though I don't think we'll be walking much!" Bogart VF, now 11 years old, is a product of Ventura Farms, in Thousand Oaks, California. Charisse got him at 10 months of age with a couple of other horses, when a client of hers had a misfortune that was going to leave her unable to feed her horses the next year. She gave them to Charisse with instructions to sell them or give them away or keep them, as long as they got good homes. Charissse started Bogart in training, and saw some raw talent in him. She kept him. He's now 14 for 16, including 12 top ten finishes, and 3 Best Condition awards. "He's sweet and submissive in the herd, but the opposite of what you'd expect in competition: he's fiercely competitive on the trail." When he moves, you can see why Charisse says he's like riding on a cloud: he's got a light, long stride, and an easy canter. Both horses are scheduled to go to the next step of Selection Trials in Danville, Illinois, which begin on August 12. While it may not be as humid in LA as the conditions that the horses will encounter in Illinois, it's hot - temperatures are usually in the high 90's and 100's in the California summers. They will be well prepared. It's an enormous commitment to take on this World Endurance Championship quest: riders must be willing to take at least 2 months off - from their work, farms, lives - and the monetary challenge is great. 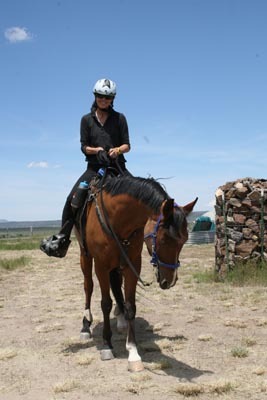 Some local endurance riders and friends are hosting a fundraiser for Charisse on July 25th, and already Charisse has had offers of donated supplies from horse people she hasn't even met yet. "It's interesting to see such enthusiasm from all kinds of people. And humbling." A quiet and calm, but fiercely determined competitor herself, Charisse is ready to tackle the further challenges of the next phase of Selection Trials. 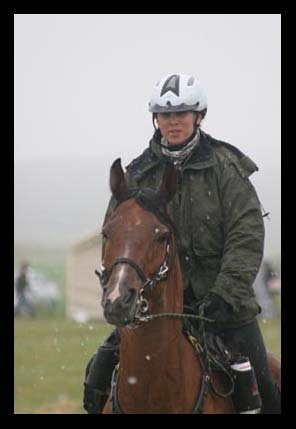 In her 14 years of endurance riding, she's managed to mark a couple of international competitions off her bucket list - a completion at Ribiers in France in 2007, and the Tom Quilty in Australia in 2008. She's hoping she'll be able to check off the World Endurance Championship in 2010 next.